One of 13 Cuviers' beaked whales (Ziphiius cavirostris) stranded in Kyparisiassis Gulf in Greece in 1996 after the use of naval sonars in the area. This is Genevieve Johnson speaking to you from the Odyssey in the Mediterranean Sea. Earlier this fall while working off southern Turkey and the Greek island of Rhodos, the Odyssey crew counted 6 North Atlantic Treaty Organization (NATO) vessels within a 12-mile radius in International waters. From 10am to 12pm we detected loud sonar pulses through our acoustic array at 15 - 30 second intervals. Listen to a short audio recording of the navy mid-frequency active sonar heard through the Odyssey acoustic array off the coast of southern Turkey. Man made noise in the oceans is one of a suite of threats to whales and smaller cetaceans that was on the agenda at this year's International Whaling Commission (IWC) Meeting in Sorrento, Italy, in which numerous threats to the long-term survival of the world's cetaceans were discussed. In addition to recognizing the impacts of whaling, fisheries bycatch and pollution, Ocean Alliance President Dr. Roger Payne, together with other leading bioacousticians and biologists gathered to discuss the burgeoning threat of anthropogenic noise. Naval exercises incorporating sonar testing are a regular occurrence in the Mediterranean Sea. 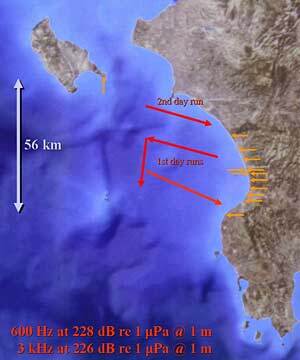 Dr. Alexandros Frantzis of the Pelagos Cetacean Research Institute (PCRI) joined the Odyssey several weeks ago. 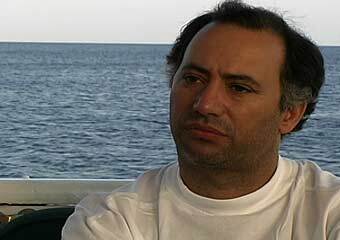 He told us of his experience ten years back with Navy sonar and Cuvier's beaked whales (Ziphiius cavirostris) in Greece. Cuvier's beaked whale is one of about 20 species of small to medium sized toothed whales. This species is a squid eating, deep-diving, pelagic cetacean that rarely strands in groups. Worldwide, only seven strandings of more than four individuals have been recorded since 1963. Beaked whales are very elusive animals and it is rare to see them alive in their natural habitat - most of what we know about them is from stranded animals. However Cuvier's beaked whales seem to be relatively abundant in the Eastern Ionian Sea - a region of the Mediterranean where we have been trying to learn more about them. "Work between PCRI and the Cuvier's beaked whale started in 1996. During May of that year, we were informed by Greenpeace Greece that some strandings of Cuvier's beaked whales occurred in the west of Peloponnesus in an area called Kyparisiassis Gulf. We tried to go there as soon as possible and we faced something completely unusual - at least 13 whales were stranded along 40 kilometers of coast." Man-made noise in the oceans, including navy sonar, is identified as one of a suite of threats to the long-term survivals of the world's cetaceans. 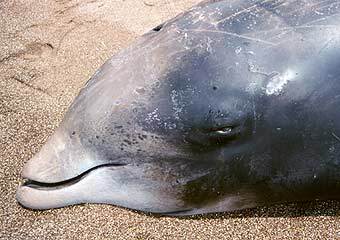 The use of of anti-submarine warfare (ASW) sonars has coincided with mass beaked whale strandings around the world. Dr. Frantzis knew that mass strandings, in which a group of whales strands along a short stretch of beach and dies together, were common, but that synchronized strandings in which dead animals are found scattered along many kilometres of coast were all but unknown (just the seven strandings mentioned earlier). Although all of the whales Frantzis studied stranded alive, by the time Frantzis and his team arrived, most had already died. What most puzzled the scientists was the general appearance of the whales - they seemed perfectly healthy. When their stomachs were opened it was evident they had recently fed. Frantzis didn't understand what could have happened. He started searching for possible causes, everything from earthquakes, pollution events, and meteorological phenomena. But nothing seemed to correllate with the stranding, until finally, Frantzis and his team stumbled across a likely cause. "Later on and in collaboration with Hellenic hydrographic surveys we found a notice to mariners, it was saying that some naval exercises of NATO (North Atlantic Treaty Organization) were taking place in the area at the very same moment and in the very same location. We found out that NATO was using some new technologies, new military sonars during the exercises." Frantzis informed NATO about what happened along with his conclusions and went on to prepare a paper that was later published in NATURE, addressing the problems the use of these sonars may create in the marine environment-especially to beaked whales. "We are happy that five years later, everybody recognized that this is an important problem in the ocean - noise pollution and in particular noise pollution from military sonars. Even NATO came out publicly and said the cause of that stranding was the use of sonars." The US Navy once searched for submarines by listening passively for their sounds. But as subs became quieter the Navy started to develop active sonars that could make sounds loud enough to find them at a distance. The Navy currently works with two main types of anti submarine warfare (ASW) sonars - SURTASS LFA (Surveillance towed array sensor system low frequency active sonar) and tactical mid-frequency sonars. Both LFA and mid-frequency sonars are built to find submarines. The LFA operates at around 300 Hz and has a back-calculated source level of 230 dB re. 1µPa (one millionth of a Pascal). It has often been accused of causing beaked whales to strand. It was claimed to be the cause back in 1996 when the issue was first brought to public attention. But when looked at more closely, it became apparent that in many strandings the LFA hadn't been used. Yet, in ALL strandings, tactical mid-frequency sonars were used. From the start, Roger Payne cautioned that there was no solid evidence that LFA sonars were the problem. He suggested that mid-frequency sonars were a more probable source of the problem and should be looked at. Over the past 8 years, more has been learned and increasing evidence now leads many scientists to conclude that mid-frequency sonar is the more culpable culprit than SURTASS LFA sonars. With source levels of 235 dB re 1µPa @ 1m, mid-frequency sonars are the most powerful sonars used in the ocean. To experience that kind of sound intensity in air you would have to expose yourself to the noise of an assault rifle being discharged a meter from your ears. Such a mid-frequency sonar generates frequency-modulated pulses of 1-2 second duration in the 1-5 kHz band, but it emits sound horizontally, not vertically as in the more familiar fish finding and depth sounders. The mid-frequency sonars are designed to perform direct-path ASW search, detection, localization, and tracking. The sonar pulses are made by submarine-hunting surface warships such as destroyers, cruisers and frigates. Their enormous, transducers are mounted behind bulbous domes covering almost all of the ship's bow below the waterline. (Evans and England 2001). The loud pulses made by these sonars propagate as sound waves through tens of kilometers of ocean water. When they bounce off an object in their path, the echo that returns to the source is analysed to determine whether it is an enemy submarine, and if so, the sub's location. A map of the mass stranding of Cuvier's beaked whales in 1996. The red arrows are the tracklines of the NATO vessel - the orange arrows display areas of beaked whale strandings. The Navy has agreed that their use of sonar causes whales to strand. However, no one yet knows just how the sounds cause the whales to strand. Scientists originally suggested that the sonar 'pings' might cause direct physical damage to the animals' and/or their ears. However, more recent research suggests that whales may change their behaviour in ways that have physiological consequences (Houser et al., 2001). For example: if they are diving deeply when a nearby sonar turns on, their reaction to the noise may be to make an accent so rapid it triggers the release of nitrogen bubbles in the animal's tissues; as occurs in the bends, or decompression sickness (Jepson et al., 2003). Although there is still no definite proof of this theory, panicked surfacings could explain why some whales suffer serious effects even when relatively far from military sonar sources. "A lot of people probably heard about the stranding that occurred in the Bahamas close to the United States. Later we had another one in the Canary Islands and many others smaller or larger occurred all around the world. So little by little it was evident what was the problem. So at least now many different research teams and also the navies are trying to find solutions to the problem." Franztis is pleased that scientists and the navy are working together to find a solution, but is concerned that we may still be underestimating the seriousness of this problem. "The problem is not just the dead whales we are finding on the beach. The problem is that perhaps there are many other whales that are dying in the open ocean and we will never see them - we will never learn about them. The problem with these sonars is at that time only NATO and the US Navy had this kind of sonar. It seems now that many more nations have these sonars and this creates many more problems. Just a few days before coming onboard Odyssey we heard about a new stranding of Cuvier's beaked whales in the Canary Islands. Once more there were warships in the area and military exercises with the use of sonars were occurring in that area - so the problem is still there." Dr. Alexandros Frantzis aboard the RV Odyssey. The navy has agreed that their use of sonar causes whales to strand. However, no one yet knows how. Dr. Frantzis is concerned that the seriousness of the problem is underestimated with an unknown number of whales dying at sea and an increasing number of nations using these sonars. So what is being done to solve this problem? Before the IWC meeting scientists were uncertain as to whether the SURTASS LFA type sonars were the main culprit in putting whales up on beaches. However, papers delivered at that meeting clearly pinpointed mid-frequency sonars as one of the principle causes of whale strandings. But they are not the only source that was implicated: a further culprit is the sounds made by the kinds of towed air-gun arrays that oil companies use when prospecting for oil. These are huge collections of noise makers and hydrophones that are towed behind a ship. The air guns generate a blast of intense sound every few seconds. It propagates into the rock of the ocean floor. Analysis of the echoes that return from different rock layers enables geologists to spot probable areas under which petroleum may lie. The sounds carry so far in the sea that prospecting ships working near continental margins are clearly audible above the deafening roar of ships' traffic, all the way to the middle of the ocean. We don't know what sorts of sounds all beaked whales make-we just don't have the recordings. In fact, there is so little general information about beaked whales that if we are ever to hope to understand how noise in the ocean affects them, we will have to make a concerted scientific effort. As part of a program at Woods Hole Oceanographic Institution (WHOI), the Navy is putting major funding behind a tagging project that seeks to understand whether there is anything in the diving physiology of beaked whales that may be causing them to strand, and how and if the presence of whales in a given area can be detected acoustically. Once this is known, the Navy will be able to avoid using mid frequency sonars in areas frequented by beaked whales (Johnson et al., 2004). Johnson, along with Tyack at the Woods Hole Oceanographic Institution have successfully attached four, non-invasive acoustic recording tags to four beaked whales - two Cuvier's beaked whales in the Ligurian Sea of the Mediterranean, and two Blainville's beaked whales, Mesoplodon densirostris off the Canary Islands. The tags recorded the sounds of these whales, and analysis of the sounds showed that these beaked whales were making ultrasonic sound pulses and using them in ways that show they are probably echolocating their prey during deep dives. The fact that it is now known what their sounds look like is an important step in understanding the behavior and habitat use of these animals, and in identifying risk factors for exposure of beaked whales to noise. M. Johnson, P.T. Madsen, W.M.X Zimmer, N. Aguilar de Soto and P. L. Tyack. Beaked whales echolocate on prey. The Royal Society, Biology letters. 2004. J. theor. Biol. (2001) 213, 183-195. Wood's Hole Oceanographic Institution scientist, Dr Peter Madsen discusses - "The Deceptive Decibel - Pitfalls in the Discussion on the Effects of Underwater Man-made Noise on Marine Mammals. For more information about the Pelagos Cetacean Institute in Greece - click here. Read more about the International Whaling Commission Meeting in Sorrento, Italy in 2004. 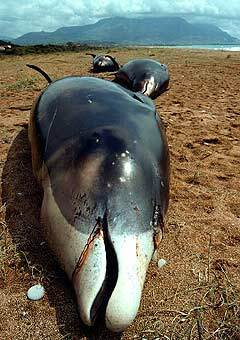 Read previous Odyssey log about a Gray's beaked whale stranding in Western Australia. What did the crew report on one year ago in Mauritius? Two years ago in the Seychelles? Three years ago in Australia? Log written by Genevieve Johnson & Roger Payne.